Calibre Door Closers, Inc. is a veteran-owned small business located in Orange, California 92867-3403 U.S.A. participating in business with the U.S Government and its affiliates. Calibre Door Closers, Inc. is a manufacturer and wholesale distributor of manufactured goods, primarily hydraulic door closing operators for swing doors, and locking/pivoting hardware as it relates to the aluminum & glass storefront entrance swing door. In addition to furnishing our product to OEM manufacturers, and contractors for new construction, Calibre furnishes product directly to the government for replacement, retrofit, and facility build-out improvements. 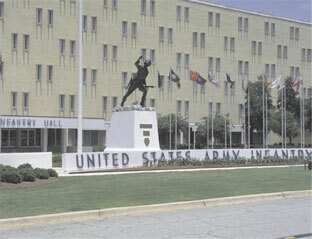 Fort Benning includes more than 300 major buildings. Barracks, classrooms, offices, specialized training facilities, clinics, hospitals, schools, warehouses, and apartment buildings. Surface Applied Door Closers C02012, C03012, and Overhead Concealed Door Closers C05062, C05082.